At PersonalizedThings by Exposures, we know you love your family — as well as the all-American appeal of baseball. That's why we help you create memorable home decor and sports decor to celebrate your two loves: family and the Los Angeles Dodgers! 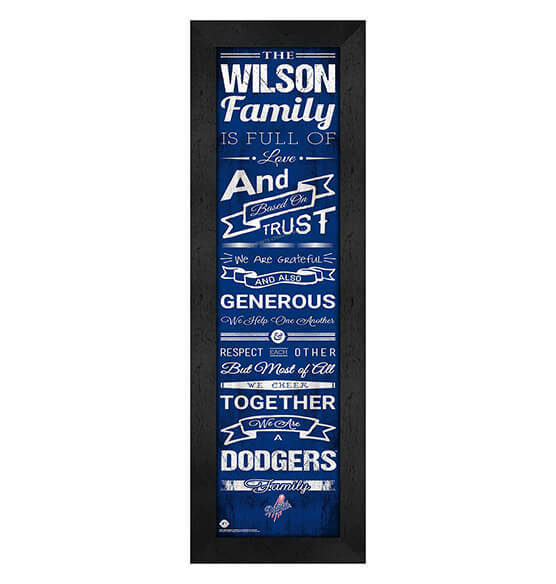 This vertical-hanging sports wall art features vibrant Los Angeles Dodgers team colors and their logo as well as a sentimental saying that expresses just how you feel about your loved ones. Ideal as a gift or to purchase for yourself, this Personalized Family Cheer Los Angeles Dodgers wall art is easy to customize and easy to hang thanks to its included sawtooth hanger.